While being on a nice little vacation with my boyfriend and two of our other friends, my skin became incredibly dry. I assume it was due to the slight change in the weather and water, but it made me feel as if I had never touched lotion in my life. Thankfully, I packed a couple of items that saved the day and kept me sane. I have tried the Soap & Glory Hand Food Hand Cream, but L'Occitane's works ten times better. It moisturizes so nicely without being greasy and doesn't have an overbearing scent. This stuff comes at a hefty price, but it works wonders and will last for quite some time (it's 5.2 oz!). If you sit in front of your heater all winter long, you're going to want the foot cream in your stash immediately! If you're not willing to spend that much before trying it, Sephora has a smaller version of the hand cream for $12. As I mentioned in my "Habits I Need To Break", my cuticles are disastrous. Thankfully, this cuticle cream is a life saver and is AWESOME at keeping my cuticles moisturized. When my cuticles are moisturized, I don't peel. This cuticle cream + my fingers = happy Amaris. Although the SPF gets me a little oily, it's nothing a little powder can't fix. I have been using this lotion for over seven years now and my skin rarely breaks out or sprouts a pimple. Although I stated that this was nothing special to me in this post three weeks ago, I have changed my mind. My hair has felt significantly more dry after returning to my Dove conditioner and I find myself wanting to use this hair mask because of the moisture it provides. The ends of my hair are holding up pretty nicely, which makes it a lot easier for me to grow it out! Even if you're not traveling, these are still great for chilly and dry days. 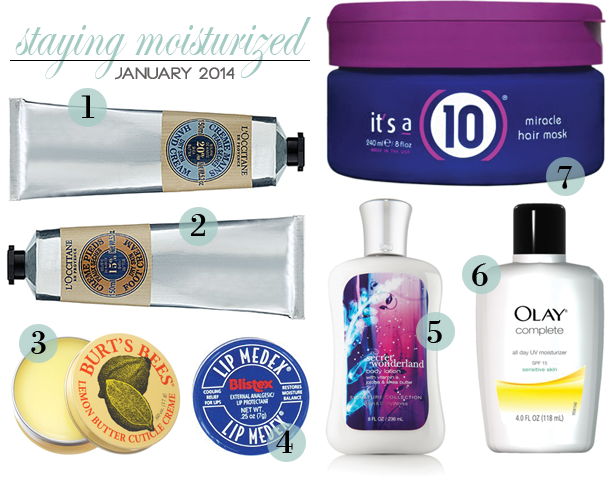 What products are you using to stay moisturized this winter? I've heard so many great things about everything from It's a 10 that I want to try all of their products!! I love Burt's Bees and Blistex!! Glad these products saved your skin while you were away! Yes, I am all about moisturizing, especially in the winter when my skin is extra dry. I love the L'Occitane hand creams!